Midway Games is a legendary name in the world of electronic entertainment, having created some of the most famous and successful arcade games of the 1980s before moving into the home gaming market in the 1990s. Sadly, Princess Debut proved to be Midway’s swansong, as declining sales as a result of the recession drove the veteran game publisher into bankruptcy shortly after the game was released. London-based Eye-D Creative provide communications and marketing solutions in print, interactive media and video. 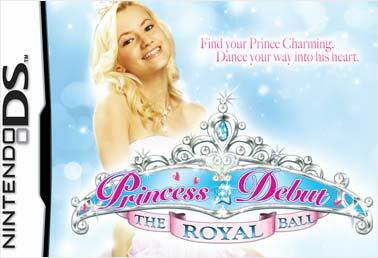 Having already worked on a number of key Midway product campaigns, they were approached by the company once more to produce the packaging for Princess Debut, a ‘rhythm action’ game for the Nintendo DS handheld console. Released with manga (comic-book) visual styling in Japan and aimed squarely at young female gamers, the game needed to be repackaged in order to maximise its appeal in Western markets. Midway liked to retain close control over their games’ presentation, and had provided Eye-D with a fairly precise brief in terms of the visual style they were looking for: a classic European princess with blonde hair and blue eyes. With the contractual negotiations complete, Models Direct submitted a shortlist of possible models. This was reduced to two main contenders by Eye-D and Midway made the final selection: 19-year-old Yasamine.